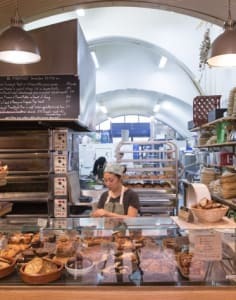 The E5 Bakehouse is an East London artisan bakery and coffee shop. They are passionate about sourdough and the lost traditions of our baking ancestors. Using organic, locally-sourced ingredients, they serve delicious, daily-baked breads, fresh lunches, homemade cakes and coffee. The head bakers also share their knowledge and expertise in a weekly bread course.